14-year-old Max Murphy's archeologist parents cancel their family vacation plans when they are given the opportunity to go on a dig in Central America. Max is not happy, particularly when they insist he remain behind. Some days later, he is surprised to receive plane tickets to join them, and is even more surprised to discover upon his arrival in Central America that his parents seem to have disappeared. He is totally clueless when he arrives in San Xavier, and the more he learns about the country, its history, its gods and goddesses - not to mention his parents and their past - the more he realizes that nothing is as he thought. Soon Max, along with a feisty Mayan girl named Lola, becomes caught up in an adventure involving stolen artifacts, secret passages, vengeful gods, human sacrifice - and howler monkeys. 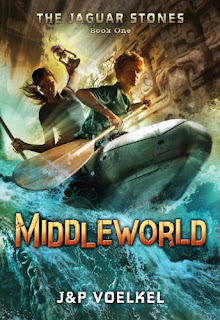 Elements of this book were highly enjoyable - the setting was an evocative backdrop for the adventure, and the mystery and fantastical elements worked well as part of that setting. And the action-packed pace is sure to appeal to young readers. I did have a little trouble with the characters, though. In the beginning of the book, Max is depicted as a self-centered, sulking, video-game-obsessed teen, and he is fairly self-absorbed and often rude throughout much of the book; because of this I didn't care as much about him as I would have liked. His about-face toward the end of the book was abrupt and not quite believable to me. I did enjoy Lola, though - she is strong and resourceful, with a fun sense of humor. Her command of the English language was a bit too full of idioms and slang expressions to be fully believable, though. The other characters were not as developed as I would have liked, and they often seemed to serve mainly as mouthpieces for the authors to tell Max (and the reader) details about Mayan history and culture. Still, this is a fun and exciting beginning to an adventure series that will appeal to readers who enjoy exotic backgrounds, fast-paced adventure, and an intriguing fantastical mystery. Charlotte's Library: "The plot is light-hearted, but with scary bits. It was taken to very wild extremes, yet the fantastical, for the most part, avoided the twin traps of jungle-treasure-adventure-stereotype and farce." The Discriminating Fangirl: " The basic plot shows real promise at being a spellbinding adventure story that would grip all ages. Sadly, the execution could have had a lot more trimming and polishing and the overall effect is a book with great potential that fell far short." The Reading Zone: "Love, love, love this book! Like Riordan’s Percy Jackson, The Jaguar Stones is a rollicking adventure. Along the way the reader is immersed in Mayan culture." I have to ditto Ladytink's comment because that's almost exactly what I was going to say! This book looks good, where could i get a copy of it? Ladytink and Cat - I honestly didn't mean to be so negative - it really is a fun book, and I definitely enjoyed it. I intend to read the second one, so I'll let you know how it goes. Md. Muddassir Shah - I think you can get it through any online bookseller - or with any luck, your local library!